What Social Media Platforms Are Your Customers On? Social media has become one of the most useful channels for small businesses to engage and interact with their customers. If you are ignoring this marketing channel, then you are missing out on one of the best ways to keep in touch with your customers and find new customers. This three-part series is going to explore how you can connect with your ideal customers, engage in personable conversations, and grow your social media following. In the first part of Social Gone Small, we’ll explore the popular social media platforms and who is on them so you can decide where to devote your time. In Part 2, we’ll look at a few content hacks to develop your social media voice that will best engage your ideal buyer. Finally, in Part 3, we’ll explore how you can grow a cult-like social media following. Which social media platforms are your customers on? Let’s see who’s talking and where they are meeting up. According to Statistica.com, Facebook is the most used social media site in the U.S. by far. Over 45.6 percent of social media visits are on Facebook. Therefore, it is a good chance that your customers are spending significant time on this site. Facebook started out with college students using it primarily, but now it has become a mainstream site with users from age 16 to 65 and older spending time there in groups, chatting with friends and posting their activities. In fact, 45 percent of Internet users 65 and older use Facebook and make up 10% of Facebook’s user base. Bet you didn’t even have YouTube on your list as a social media site, did you? YouTube comes in second on the list at 21.2 percent of social media visits. YouTube is also the second largest search engine after Google. And guess who owns it? That’s right, Google. If you are not taking advantage of the power of YouTube, you are surely missing opportunities to engage your prospects and customers. Videos can be embedded on your site, and they come up in search on Google as well as on YouTube. Videos are increasing in popularity as more people adopt mobile devices. 72 percent of U.S. Millennials, 58 percent of Gen X and 43 percent of Baby Boomers use YouTube. Twitter is the third highest with only a mere 4.58 percent of visits. This site has morphed into a way to blast out quick messages including images and GIFs. On Twitter, you have 140 characters to get your message across. Similar to texting, Twitter acts as an announcement except that the messages can be shared, searched and broadcast. With 187 million people actively logging into the platform each month, LinkedIn is an excellent option for connecting with a business-focused network. LinkedIn has become a content powerhouse for professionals, networking, and job hunting, allowing its users to become thought leaders in their field. It is widely used by B2B companies as well as business owners. Reddit is a bookmarking site with a social media aspect. Reddit is a private company and much quieter than other social media sites such as Facebook. However, 3.92 percent of social media visits went to Reddit, not far behind Twitter. Reddit’s main demographic is 18 to 29 year old males. Pinterest begins the next group of social media sites that all range between 1.20 and 1.50 percent of social media visits. However, Pinterest’s success shows that 1.50 percent of visits are quite influential. Pinterest’s audience is 85 percent female with a concentration of users in the U.S. Pinterest pins are searchable on Google which helps make this site popular. 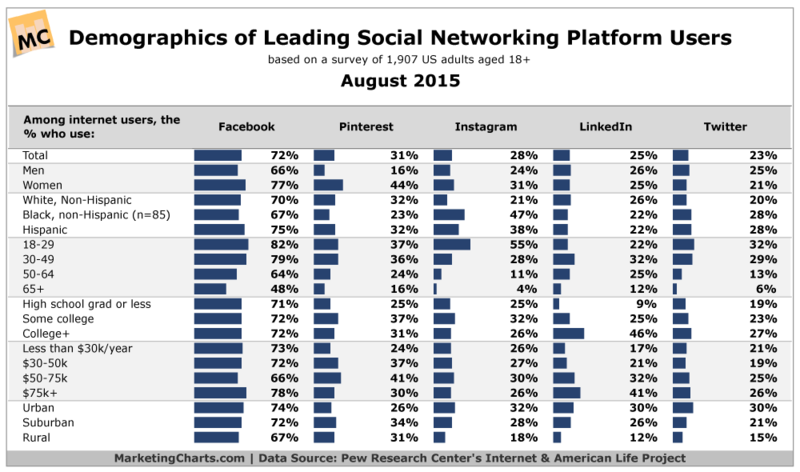 Other social media sites that are in the top 10 are all in the same range as Pinterest for percentage of visits. These include Tumblr, LinkedIn, Reddit, Google+ and Instagram. Of this group, Instagram is the newest and growing fast. Tumblr is most popular with teens ages 13 to 17 and young adults ages 18 to 34. Instagram is almost exactly split between males and females. 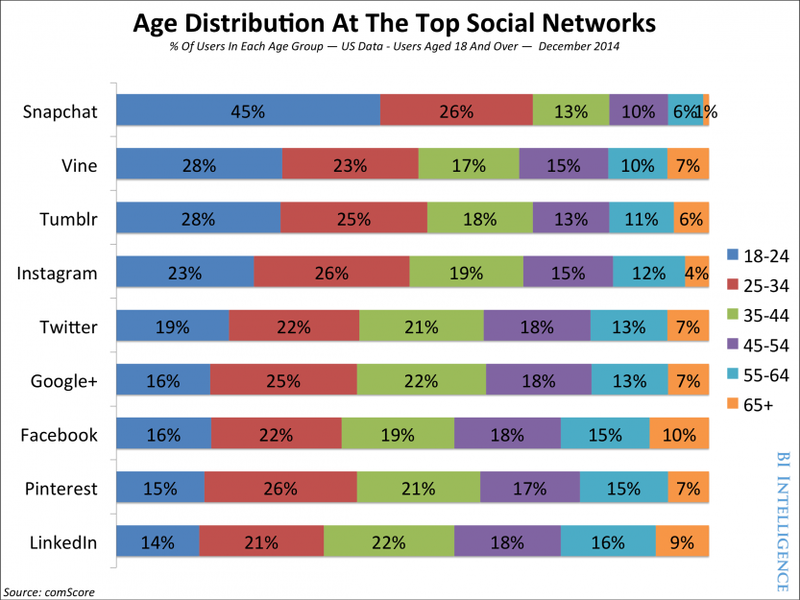 90 percent of users are younger than 35. Google+ is used by 58 percent of U.S. Fortune 500 companies and 52 percent of U.S. charities and non-profits. Despite a lack of activity compared to the other platforms, Google+ makes a strong, positive impact on your SEO. These short facts will help point you in the right direction. Poke around in each network and search for relevant topics within your industry to find active communities. It will help you get a feel for each platform and allow you to make a better decision on where to focus your social media marketing efforts. Next, get more insights into how to engage with your audience in the Social Gone Small series.